In the early 1860s, Benwell experimented with Dissolving Views, which have been described as 'pictures thrown on a screen and made to pass one into the other'. Either large hand- painted or photographic glass slides were used. We know from advertisements in papers such as 'The Era', The Athenaeum' and 'The Times' that Benwell painted several series which were used to accompany lectures and exhibitions. The Dictionary of Indian Biography' states that "he painted a series of dissolving views of Indian life", and the journal 'Sunday at Home' 1862 refers to 'dissolving views painted by Mr Benwell ' (refer below). The dissolving view has been described as 'the ancestor of the cinematic dissolve, whereby 'light was slowly stopped down on one lens and one image, and brought up on another, with perfect registration, so that the second image slowly- almost magically- replaced the first on the illuminated screen.' Dissolving views became a familiar 'engine of public instruction' in Victorian times. and were used in magic lantern shows that were so popular in England between the 1860s and 1890s. They brought the wonder of nature, empire and science to respectable family audiences in Victorian times. Dissolving view lectures on all manner of subjects were a regular feature at the Royal Polytechnic Institution and the Adelaide Gallery in London. In 1862, Benwell painted a series of dissolving views to illustrate lectures on the cotton famine by the well known Professor J H Pepper of the Royal Polytechnic Institution (refer below). Dissolving views were also used by religious groups to illustrate their lectures; Benwell created a series on Indian Illustrations of Scripture' (refer below). By the 1860s magic lantern shows purely for amusement or entertainment were also becoming popular and were widely attended by the Victorian public. There was an art to the creation of hand-painted lantern slides, and many known painters and artists were hired to paint the views for the sessions of the Royal Polytechnic Institution. Benwell is mentioned in the book 'Magic Images: the art of hand-painted and photographic lantern slides' (ed, Crompton, Henry and Herbert, 1990). The Royal Polytechnic Institution was a London society devoted to the divulgation of science, founded in 1838. It became famous for its magic lantern sessions from the early 1840s, which were the work of Henry Langdon Childe. Professor John Henry Pepper joined the Polytechnic in the 1840s, and became its director in 1854. He was responsible for setting in motion the most ambitious period in the programming of lantern shows. The Royal Polytechnic Institution, which closed in 1881, was the antecedent institution to the current University of Westminster. It is interesting that when the contents of the building were auctioned off in 1882, the collection of transparencies was one of the most sought after lots. Extract from 'The Athenaeum' 1 November 1862. Professor J H Pepper's new lecture on the Cotton Famine, illustrated with 'an entirely new series of Dissolving Views', designed and painted by J A Benwell, Esq. Extract from 'The Era' 9 November 1862, from an article entitled 'The Polytechnic'. "......and by a set of dissolving views, painted by J A Benwell, Esq,, from sketches made during a long residence in the cotton-growing districts of India. The lecture was frequently interrupted by the applause of the audience, whose satisfaction at the whole entertainment, and especially at this portion of it, was unequivocal and hearty." 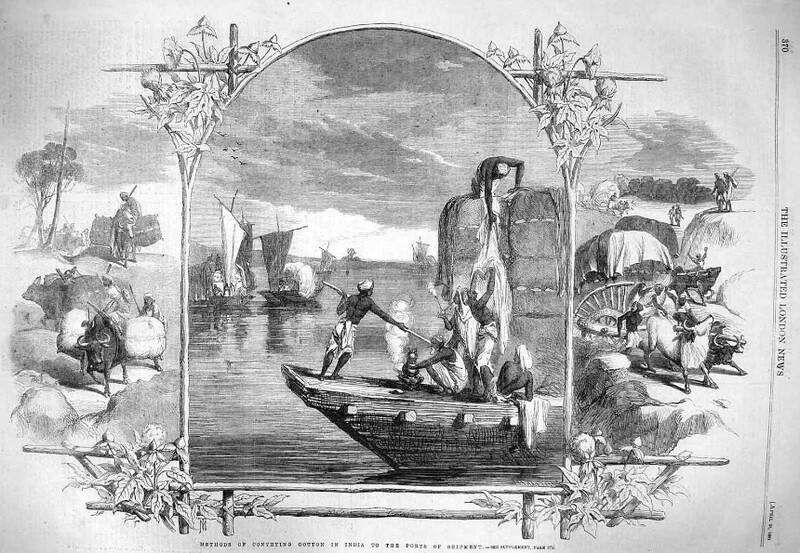 'Methods of conveying cotton in India to the ports of shipment' from the Illustrated London News, 20 April 1861, by J A Benwell. Benwell's 'dissolving views' paintings for the Polytechnic would have been based on his engravings, such as this one. 'Weighing cotton at Bombay for the English market' from the Illustrated London News, 1 October 1862, by J A Benwell. Benwell's 'dissolving views' paintings for the Polytechnic would have been based on his engravings, such as this one. Extract from 'The Era' 30 November 1862 Professor J H Pepper's new lecture on the Cotton Famine, illustrated with 'an entirely new series of Dissolving Views', designed and painted by J A Benwell, Esq. Extract from 'The Sunday at Home, a Family Magazine for Sabbath Reading' 29 November 1862, page 760. Indian Poojah to tools. Easel for hand-painting glass 'sliders', as may have been used by Benwell..